Anne Shaw is the Founder and Director of 21st Century Schools, a professional development and curriculum design company supporting educators and schools as they move further into the 21st century. Click here to view these documents: my Resume, About 21st Century Schools, Advisory Board and Brochure. Below, on the left, is a video which gives you a quick glimpse of our philosophy of education and of 21st century education. View this page to learn about our overseas experiences working with national education organizations, prime minister's offices, ministries of education and private school organizations. We were quite impressed with the value the schools placed on the arts, which have largely disappeared from American schools due to standardized testing mania. See this incredible student art in Turkey and in India. The video below on the right is a truly amazing classroom in Rajkot, Gujarat, India. Notice how confident these students are and how excited they are about their learning! Anne Shaw observing a classroom in Malaysia. 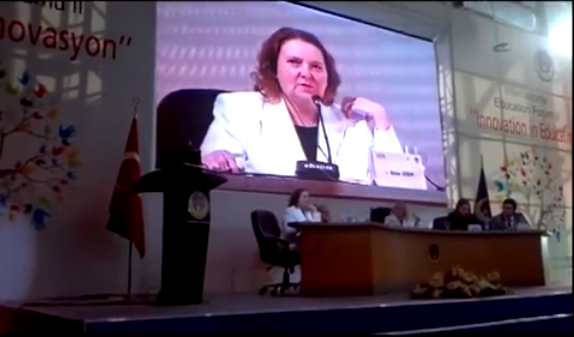 Anne Shaw presenting at conference in Ankara, Turkey.